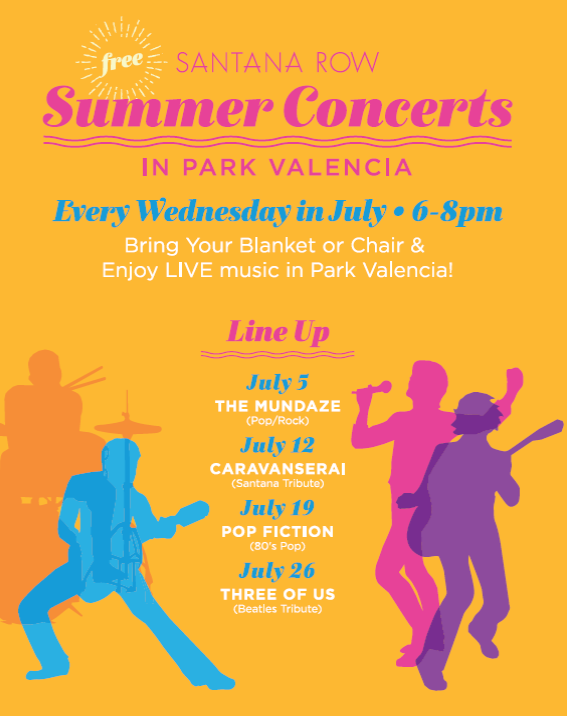 A free concert series kicks off this Wednesday at Santana Row. All of the concerts will conveniently be located in Park Valencia, which is now packed with eateries--Maggiano's, Roots and Rye, Pluto's VeggieGrill, The Counter, Kara's Cupcakes, and two brand new options: Smitten and Poke Bar. The odds are always good in July that the weather will be amazing, so grab a bite and hang out! The concerts take place from 6pm to 8pm and you can see the lineup in the flyer below.